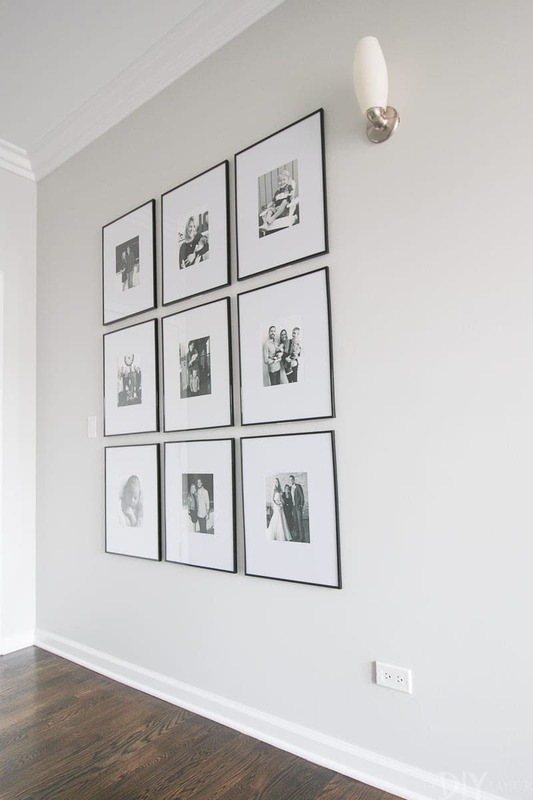 On Monday, I shared my mom’s new gallery wall in her master bedroom. As I said in that post, she is now my neighbor…living less than 2 miles away from me! I couldn’t be happier to have my favorite lady nearby. But I’m also thrilled that I have a new space to decorate! And lucky for me, my mom’s style is spot on and she trusts my judgment when making decisions for her new home. 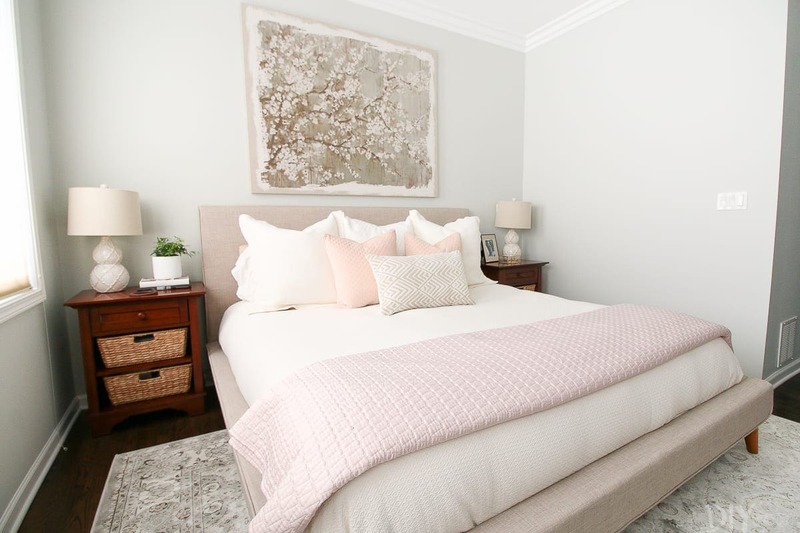 A winning combo in a “client.” We recently styled her master bedroom to include lots of feminine touches and blush accents, and today you get to see this gorgeous blush bedroom! As I said before, when my mom downsized from her large house in the suburbs, she ended up getting rid of almost all of her belongings! So in the bedroom, the only things we kept were her nightstands and duvet cover which are all from Pottery Barn. Everything else is brand new to the space. 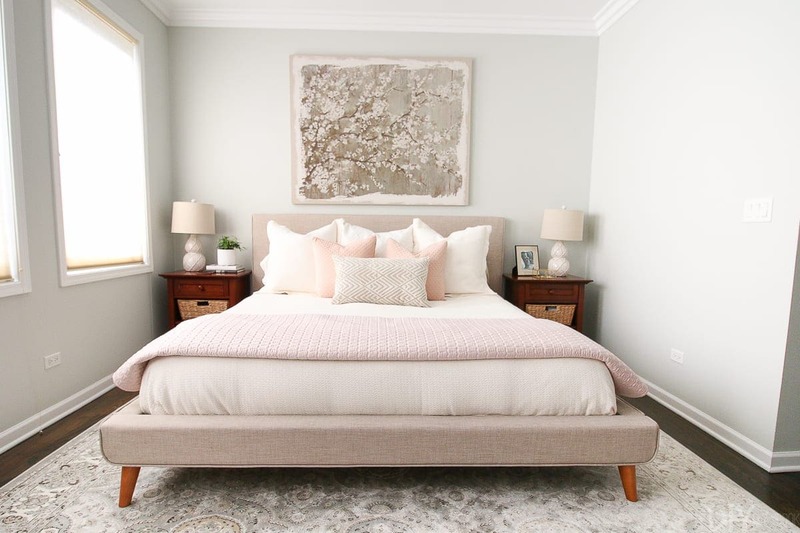 We purchased this upholstered bed frame online and it was a steal at only $470 for a king! 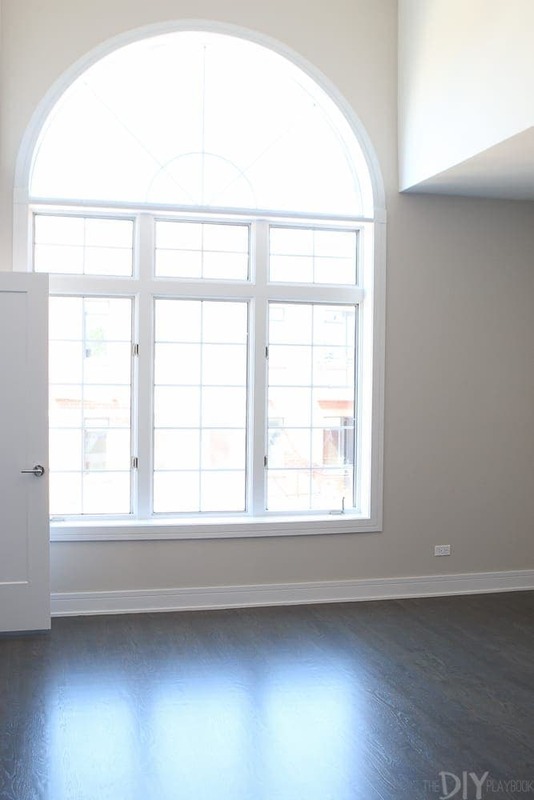 But when the prices are that good, it usually means you’re putting the furniture together yourself. I remember my mom called me and told me a HUGE box was delivered to her door and to come on over to help. We spent a few hours putting together this bed…not hard work, just time-consuming. With a shared bottle of wine, we got it done in no time at all. If you’re looking for a neutral bed, I highly recommend this one. It’s absolutely gorgeous in person and the quality is top-notch. 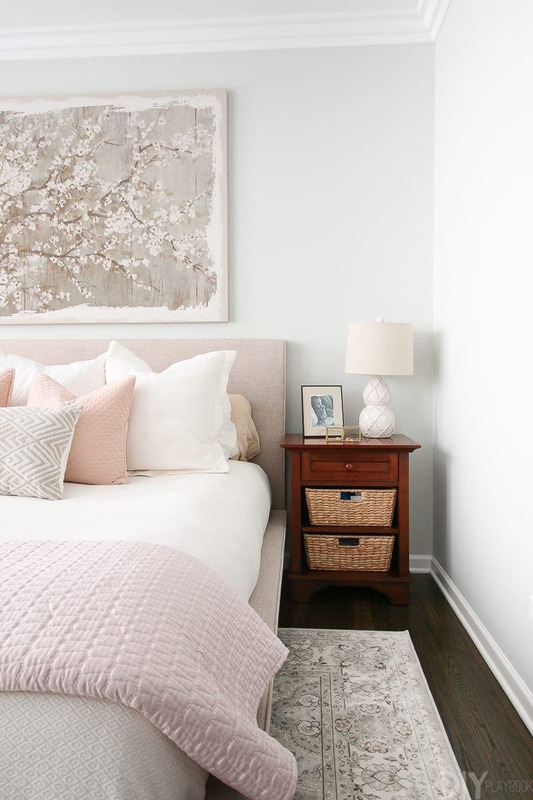 You guys know we love a textured white duvet cover, as evidenced by just about every single bedroom we design. 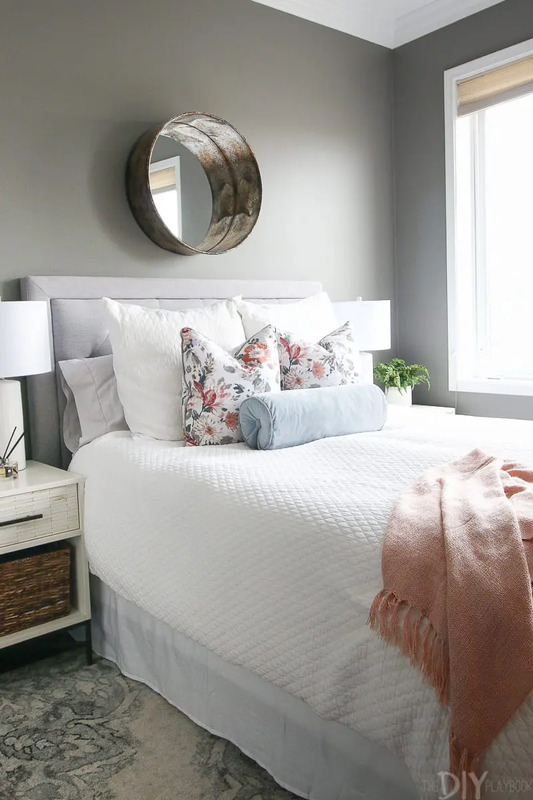 Having a white duvet is always a good idea, because then you can swap out the pillows and change up the look incredibly easily! Plus, the texture on the duvet hides any wrinkles so your bed always looks put together and perfect. 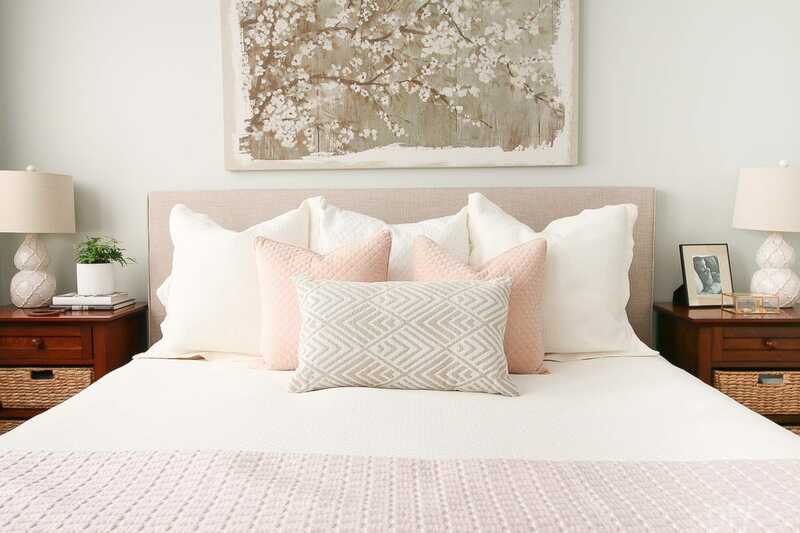 The pillows are all from Homegoods, and we love the subtle pop of pink on the bed. The quilt at the bottom of the bed is from West Elm and we got it on major clearance. We looked at a lot of different pink quilts, but this one was a nice subtle shade of pink. We found the 9×12 rug from Homegoods late last year and knew it would be perfect for the space. 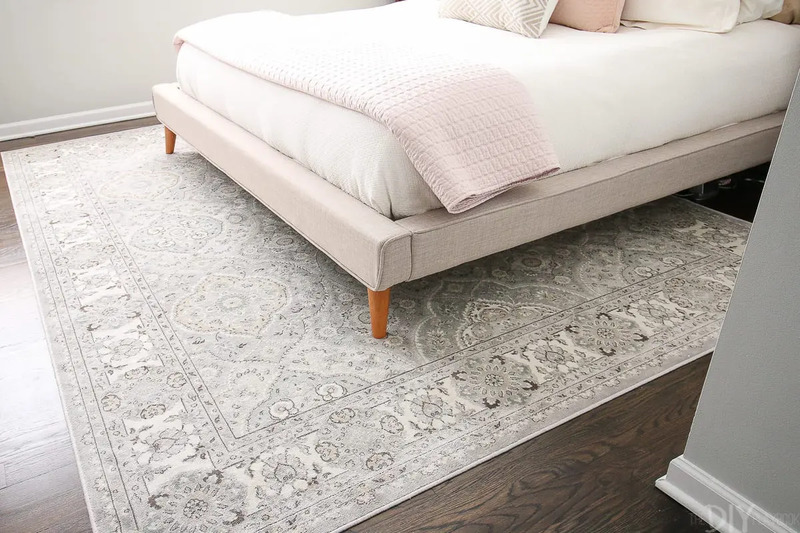 When it comes to rugs in the master bedroom, you want to make sure that you have enough peeking out on the sides and bottom of the bed. 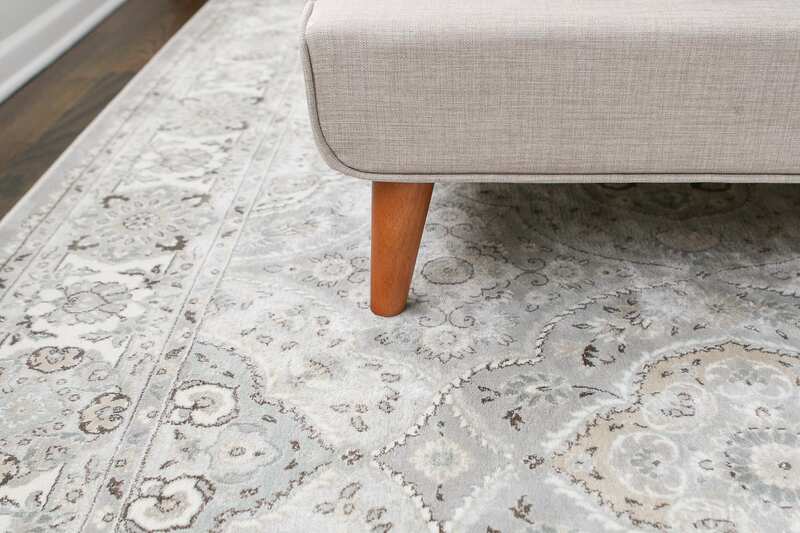 You can reference this post about finding the correct rug for your space, because lots of people are choosing rugs that are way too small! 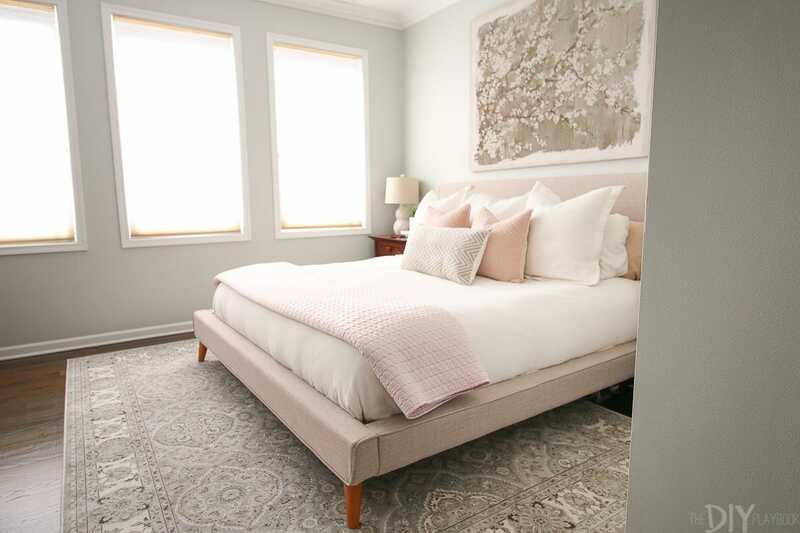 I love the colors in this gorgeous rug, neutral and elegant. Plus it’s incredibly soft. I highly recommend checking out the rugs when you’re at Homegoods. They have some great prices and you never know what you’re going to find! 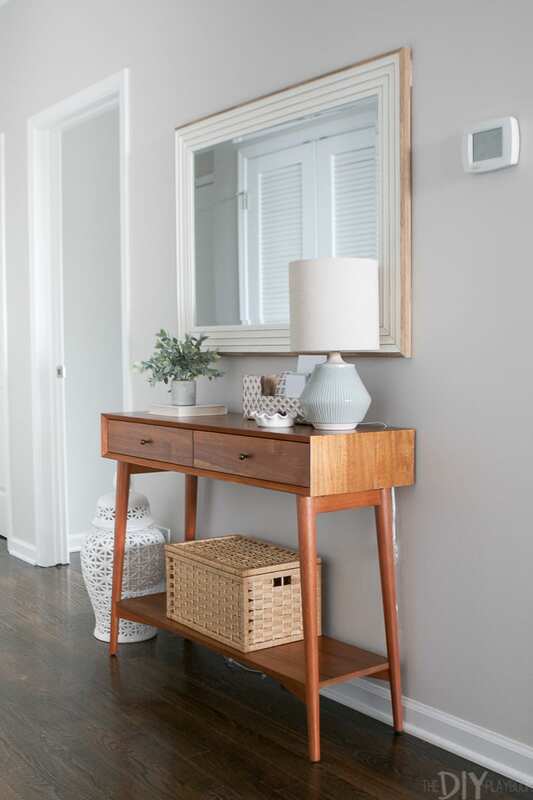 The wood nightstands come with tons of storage, which is key when you live in the city. 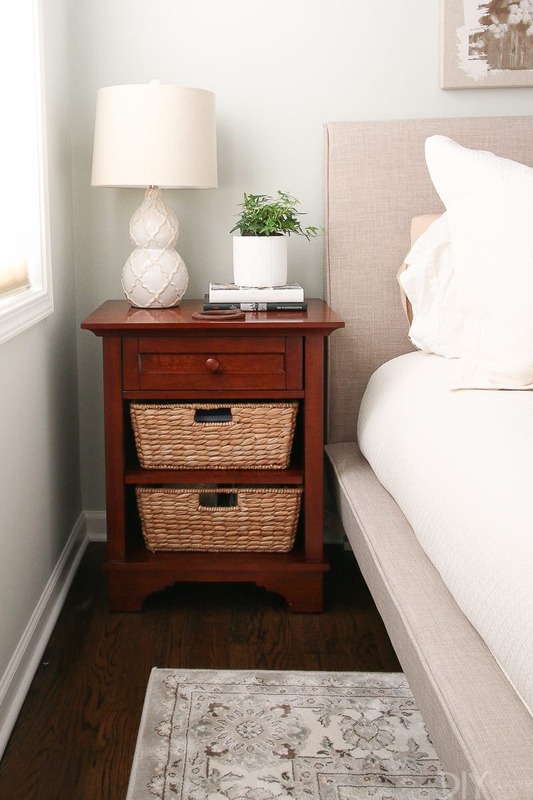 I adore the baskets because they add some texture and warmth to the side tables. We found the lamps from HomeGoods too. 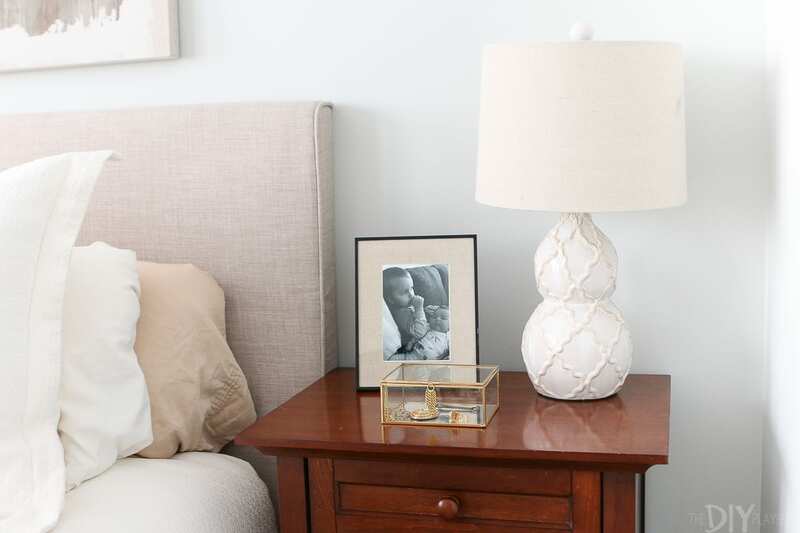 It can sometimes be tough to find matching lamps there, so when I find ones that I love that match…I scoop them on up! 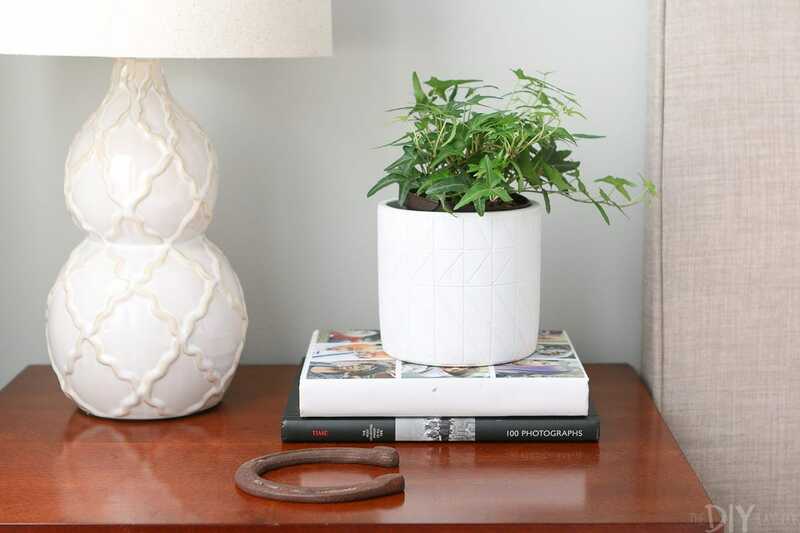 I kept the top of the nightstands simple with some greenery, a box for jewelry, and a photo of her grandchildren (her favorite!). Oh, and an old horseshoe for good luck! I absolutely love the art we found for over her bed. It’s from a store here in Chicago called The Painted Lady. 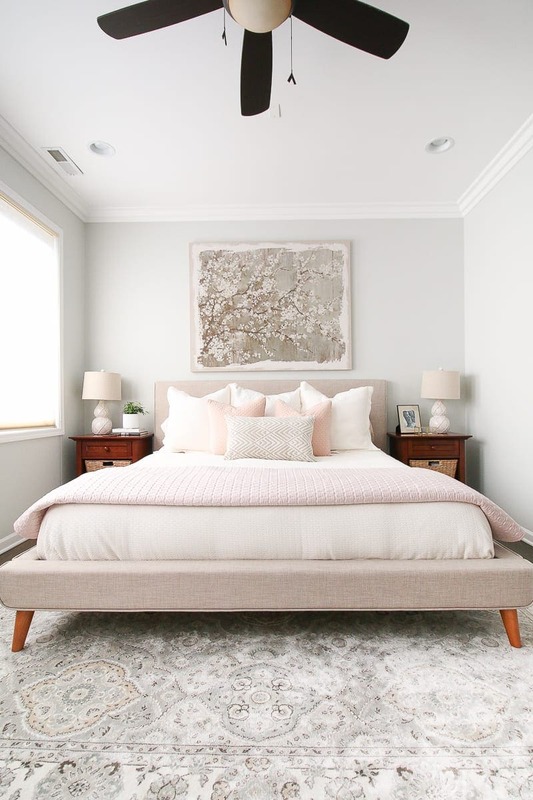 When we saw it, we knew it would be perfect for her blush bedroom. When you have a king-sized bed, it’s important to find art that is large enough to hang over the bed. This piece is BIG, so it works well to draw the eye up. 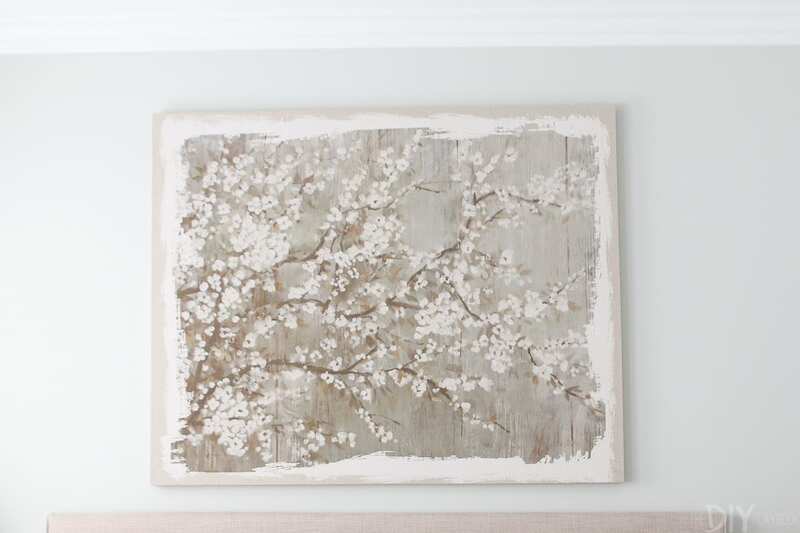 For more details on finding and hanging art in your home, reference this post. 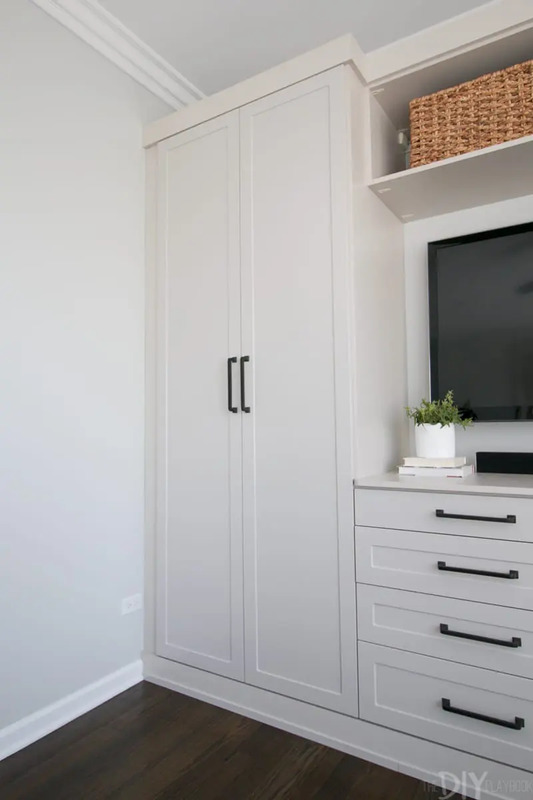 This bedroom was definitely a labor of love and it didn’t happen overnight. We started with the bed and then went sloooowly from there. 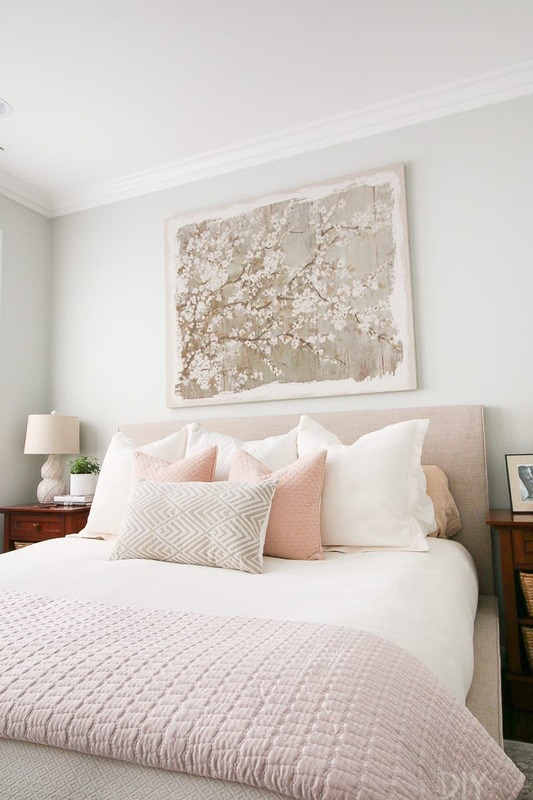 Once we added the blush, we knew it was the perfect color for this feminine bedroom and added some much-needed color to an all gray and tan space. We’re marking this side of the bedroom as complete, but we still have to tackle the other side. Jan is planning to have a large wardrobe built into the wall, so we’re waiting for that to be built before we do anything else. I’ll be sure to update you guys as we finish up the space! I’m so happy to know that my mom has a bedroom that is comfortable, cozy, and just as gorgeous as she is!